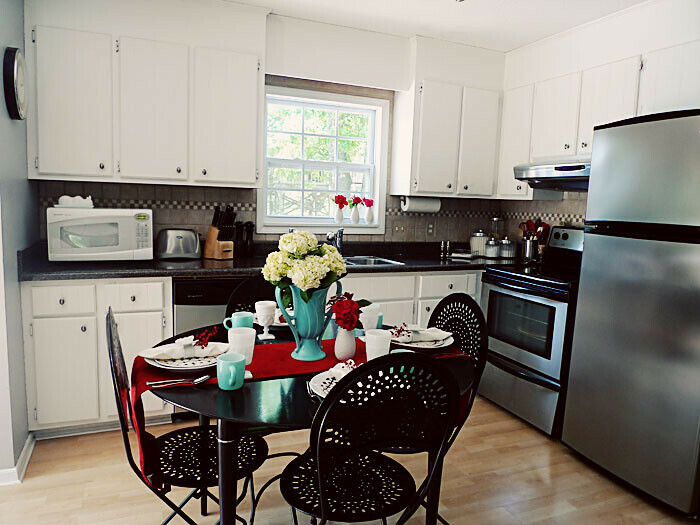 So seeing as how my kitchen has been remodeled for over 2 years now, I figured it's about time to post some pictures. Other than electrical re-wiring, Cory and I did all the work ourselves, including tiling, drywalling, laying wood floors, installing cabinets, etc. There are people who will tell you that working on your house is fun. They are crazy. They must have been hit on the head by a falling hammer. It is not fun. But, I am so glad we suffered through and did it. 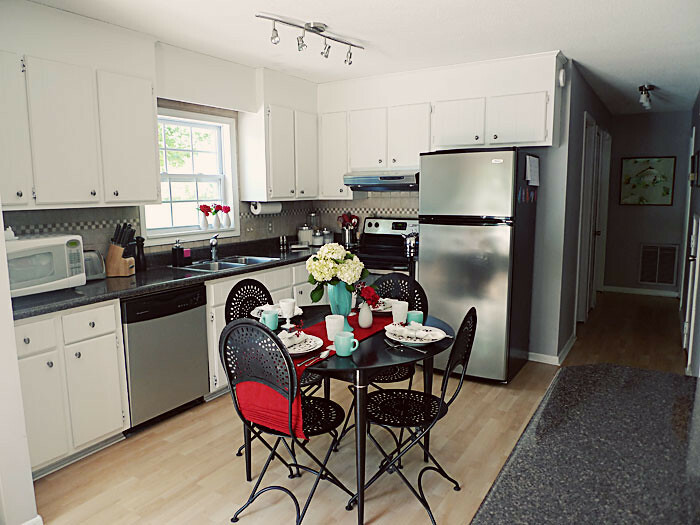 I was able to get the kitchen I wanted for a fantastic price. There were times I wondered why we were doing it... like when Lowes cut my counter top wrong 4 times in a row and I had no sink and had to wash dishes in the bathtub for a month. But in the end I couldn't be happier with the finished product. I am going to show you some before pictures of the kitchen now, but let me warn you... they are SCARY. 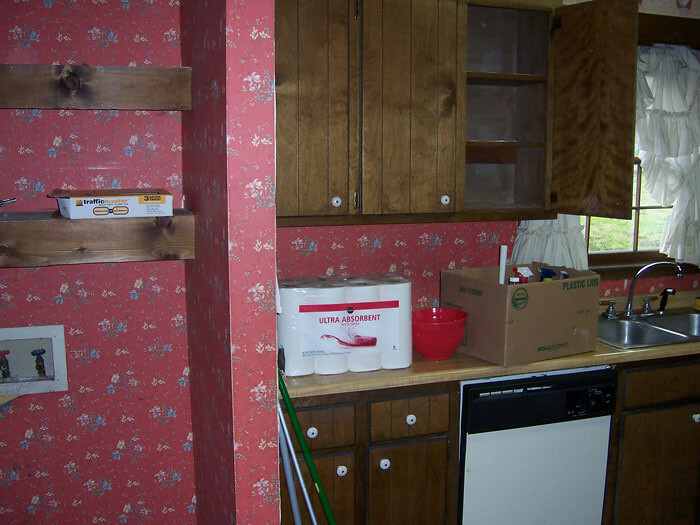 Yes, that is wall paper on the cabinets. On the cabinets! Everything was replaced except the cabinets... they are solid wood and I just couldn't justify spending thousands on new ones when these were perfectly fine. Ready to see how we salvaged this eighties disaster? Big improvement, right? I love how light and bright it is now. White paint and track lighting are miraculous tools. We actually knocked out a wall to open up the kitchen to the living room and to allow room for a extra bay of cabinets. 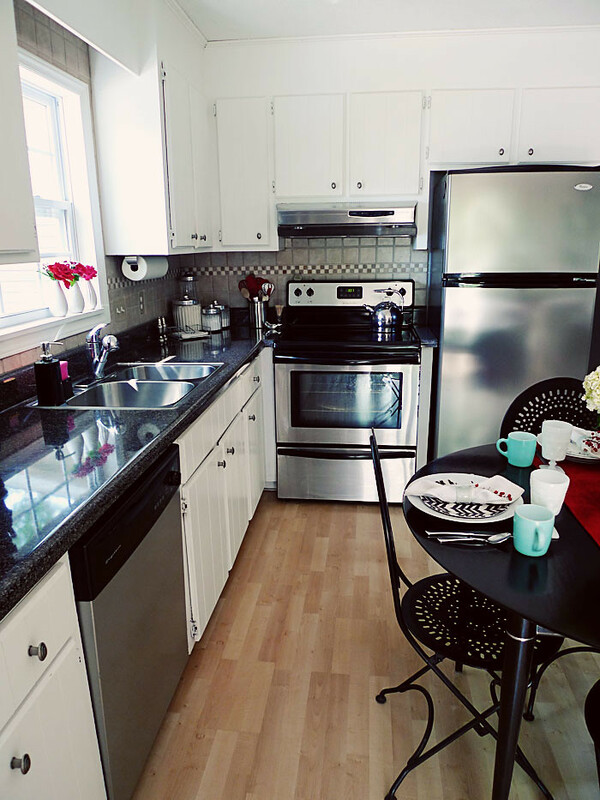 The counter top forms a peninsula, and it's perfect for cooking prep, serving food, and just hanging out at. You can't see much of this feature in the photos above, just the end of the counter top, but you'll be able to see it more clearly when I post the living room pictures. Oh, and FYI... I never want to remove wallpaper ever again. There were 3 layers, and the geniuses that put up the first one up back in '82 adhered it directly to the sheetrock... no painting, so priming. So when we ripped it off, it took chunks of the wall with it. So we had to mud and sand all the walls, repeatedly. Thanks again, guys. But nevermind that, I love my kitchen now. See the coordinating Entry and Laundry Nook before & after. Holy WOW!!! That is a GORGEOUS transformation!! Way to go guys! Brings back some BAAADDD memories!! WOW. This is incredible! Dan and I are buying a house at the end of the summer, and we want to tear out a kitchen and build one that we love... I'm excited, and scared. You guys did a WONDERFUL job! 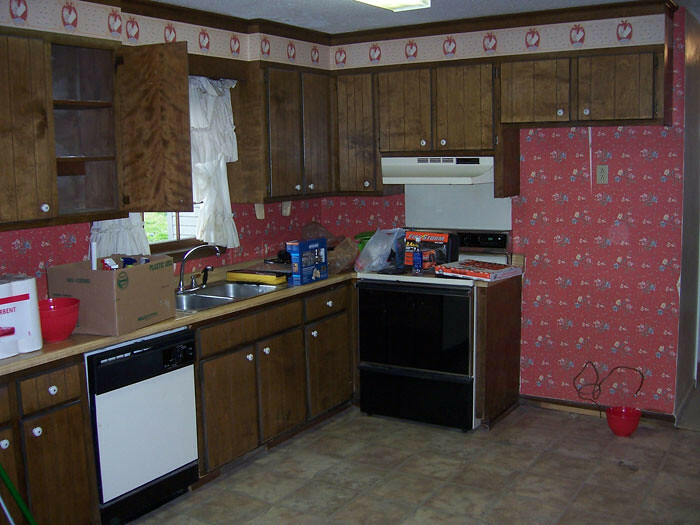 Was it hard buying a kitchen that was so ugly? Thanks guys! Emily, it wasn't just the kitchen that was ugly, it was basically the whole house! But I could see from the moment I walked in the door that there was tons of potential. Victory! Totally enjoying your blog - found it via Mr. Godbey's blog. Thanks for sharing lovely things with us. Oh my it is soooo gorgeous!! You both did a WONDERFUL job! haha that old wall paper was UGGGGGly! Wanna come do fun things in my house?! Wow! Your new kitchen looks like something out a magazine - absolutely gorgeous! I know it was a lot of work, but no doubt worth it. Looks GREAT! Oh, Erin... that wallpaper... I just want to give you a hug.